As some of you may know, I recently received a new Hammered Dulcimer as a gift. And not just any hammered dulcimer, but top of the line, hand-crafted, imported wood, amazing sound, special addition, one of a kind, best of the best dulcimer! But, if you think this is a story about a dulcimer, its not. The dulcimer is just a small puzzle piece to the full picture of this story. It’s actually a story of how one person, Drew MacLean, has impacted my life. It’s a story of God’s grace and timing; healing and obedience, generosity, and how people’s lives and relationships have intersected paths in ways unexpected. And, most importantly, its a story of Life. I know you’ll find it encouraging and worth your time! Drew MacLean and his family, Scott (dad), Marcia (mom), and Marc (older Brother), have always been good family friends of my family since we first moved to Panama City, FL in 1993. My older brother Xan (pronounced “Zan”) and I grew up playing baseball with the Drew and Marc. Xan was in the same class with Drew into High school. I personally remember Drew when I attended Mosley High. He was a great athlete, playing varsity football and baseball. I remember he was an amazing whistler and even explained his whistling technique to me once in the hall way between classes. He was a big guy, full of love for everyone and always had a great sense of humor and a big smile! He’s been the kind of guy that everyone couldn’t help but love. Back in June, Drew and his wife Allison were on their way home from vacation in south Florida. They ran into bad weather and had a single car accident off the highway. Drew went to Heaven that day. Allison, who was also 7 months pregnant, survived with only minor injuries. Their baby Ruby Lynn was completely unharmed. We got the news from Xan, who found out by a phone from a friend. We were shocked because out of all people, how could Drew MacLean be gone? How could his smile and laughter and someone who is known and loved by so many just simply not be present anymore? We left just a few days after the news to go to PC for his Celebration of Life service. When we got to Hiland Park Baptist, where Drew and Allison attended, we noticed all the cars which were in the parking lot. And when we walked inside, we could see why. There were hundreds of people lined up to speak to the family. By the time the service started, the sanctuary was full to standing room only. Then it was only a matter of time before no one else could fit. So, a number of people had to stay in the lobby and watch by video feed. I realized how many that Drew’s life had affected. We pray that no one here will ever have to go through this with a spouse or child. Words cannot begin to describe Drew’s love for Allison and his families. Drew was physically strong but his faith in God was even stronger and he showed that by the way he lived his life. We find comfort knowing that our precious Ruby Lynn will be a constant reminder of Drew. God knows the time and place of our final breath before we are born. Nothing takes Him by surprise. Knowing that, I consider it even more of a privilege that God chose me and set me apart to be Drew’s wife. No other person has, or will experience, that extraordinary love that Drew had for me and for Ruby. I’m so grateful that Drew was mine. There is nothing I would trade for the time I spent adoring Drew and being adored by him. Although we are in unimaginable pain right now, we praise You and rejoice in the fact that Drew, with his beautifully robust voice, is in Your presence, whole and healthy, singing praises to You at this very moment. Thank You, God, for every song, whistle, laugh, and moment You gave us with him. And thank You for the blessing of Ruby Lynn. I pray that she grows to be a strong and beautiful, glorifying her Heavenly Father and reminding us of her earthly father. The service was full of tears, but also of laughter and worship. 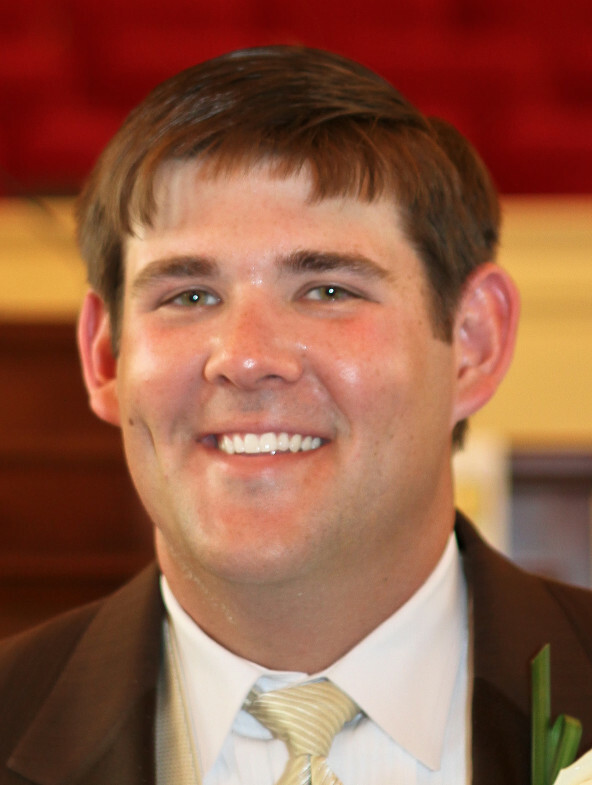 Laughter; because many of his family and friends who spoke gave Drew a hard time about being a Gator fan (for most people in Panama City are die hard Seminoles). Also, we heard stories of how Drew would pretty much do any art or crafts Allison wanted him to do, whether it be painting, pumpkin carving, and other things. But also full of worship, because praise was given to God for being in it all and bringing Drew in his Home, into Joys unfathomed; not into death but into Life. You wouldn’t think this to be a funeral. No, but a celebration; celebrating his life on earth, as well as celebrating his life now in Heaven. We were able to talk to Marcia at the service and she invited us to come to her house that night, for she was already having friends and family over. So, trying to be thoughtful and considerate to the MacLean’s state, we wondered if we should go at all. We didn’t want to bother them or be with them if they wanted to be alone. But, one thing we forgot is that they are from Mississippi. If you’re from Mississippi, company and bringing good food over to the family during a time as this is essential. My mom had picked up farm fresh peaches and tomatoes on our way down through Alabama. So, we decided that rather than coming into the house, we would just drop of the produce for them. Well, Xan was the one to get out of the car and do that. Once Marcia received the gift and saw us in the car, she immediately gave us a look like, “What are you doing? Come inside, sillies,” as she waved us in. So there we went. So, this is where the dulcimer comes into the story. I had brought it down from TN. But, what’s funny is that I didn’t originally grab it. The morning we left, we just grabbed our bags and I thought to myself, “should I bring the dulcimer too?” I thought that that would be silly because I didn’t see how I would play it in the short trip, it might be bothersome to carry around and possibly annoying to the people who hear it. So, we left the house without it. Ten minutes down the road, we stopped for lunch. During that time, I thought about the dulcimer again and asked mom, “Do you think we should bring the dulcimer?” She replied, “I was feeling that too, lets get it.” So, this is one of first amazing and humbling incidents. Soon enough, we were heading to FL with a dulcimer in the trunk. Now even though I brought it to PC, I still didn’t know how it would be used or what would happen. Back to the story, so Marcia invited us is in. We had the dulcimer but I still had concerns on whether I would take it inside. Because again, I wanted to be sensitive and not just show up and start playing without any invitation from a family going through one of the toughest things anyone can go through. But, I decided to take a risk and took it from the trunk and went in. As soon as I got in Marcia’s mother jumped up quickly and ran over to me and with a big smile and gleaming eyes said, “Is that a dulcimer?” A little surprised, I said “yes..yes it is.” She told me that she played a cousin of the hammered dulcimer, the mountain dulcimer; which is a dulcimer you strum rather than play with a mallet or hammer. So we talked and I enjoyed sharing our dulcimer and musical interests with each other. I noticed that the MacLeans’ friends were pretty much gone and it was just the immediate and extended family in the room, which was about 20 or so. As I looked and talked to a few there, I was pleased to see a home not so dreary as one may expect. But, I felt a spirit of hope amidst the reality their beloved one’s tangible presence gone. Not to say there wasn’t grieving. There was, but just not without hope. I was surprised to see Marcia still had her humor and both her and Scott were selflessly asking about us and encouraging us even in the midst of their pain. They were so strong. Soon enough Marcia noticed that I brought some kind of instrument case. And with much excitement immediately asked me to play whatever instrument was in it. So, I opened the case and people were surprised at what came out–which was a box of wood, trapezoid-shaped, with strings running across it. I shared a little about it since I don’t think anyone had seen one before. Then I decided I would play “How Great thou Art” for them. They really enjoyed the sound of the dulcimer. It really is a very unique and sweet sound. I always thought it has a heavenly sound or a sound that is soothing and healing. So, they wanted me to play more. So, I did. I played Amazing Grace and two originals called “Dancing in Heaven with Jesus,” and “As She waits.” By their remarks, I could tell they were encouraged and touched by it. It was a humbling experience because there I was playing my instrument and worshipping and sharing my heart in such a sensitive time, with people who were in such a vulnerable position. I felt so honored to play in front of such strong spiritual people, who were honoring God through unimaginable pain. They are heroes and I was just a commoner I felt. Marcia was in tears at one point and she said that this was the best way to end the day of Drew’s Service. Well, after that weekend, we went back to Tennessee. Just a week later, I got an e-mail from Marcia. She told us that she appreciated our family coming down and was great to see us. But, she also attached an e-mail from Scott. Scott apparently had sent out an e-mail to all their close family and friends to tell them about the night that we visited and I had played the dulcimer. I was again humbled because he spoke of how God has used it to encourage and bless them that night. Then, to my surprise I found that he had posted two videos of that night on youtube. I first thought, “Uh oh, I hope I did okay.” It was amazing to me that people were so touched, yet all of this could have easily never had happened if I didn’t listen to the voice that told me to go back and get the dulcimer. Thank you Lord–it was amazing to know that I could be part of something God was planning. Another person that enters into the story is Drew’s Cousin named Amy McDowell. She was there the night of the “MacLean Concert.” And, she was very interested in the dulcimer. She grew up playing piano and was very good at sight reading. She explained to me that her husband would probably really enjoy having a dulcimer because he was the kind of person who could just pick up stuff and improvise. Well, after the weekend of Drew’s service she went back to her home in Huntsville and eventually bought a dulcimer herself (but only for herself, not for her husband she decided). We started to correspond by e-mail, updating me about her new dulcimer. Marcia sent me a recording of her playing. I was very surprised to hear it was her. It was great. She picked it up faster than a bullet can fly. Now, this gets to the point of the story that I didn’t know until recently. Amy McDowell, the cousin of Drew who bought herself a dulcimer, read the e-mail and she said she felt convicted about it. She thought, “How can we help Kyle get a dulcimer?” So, she had ideas of possibly donating money to me for a new dulcimer and such. But then Drew’s Birthday was coming up on December 20th. 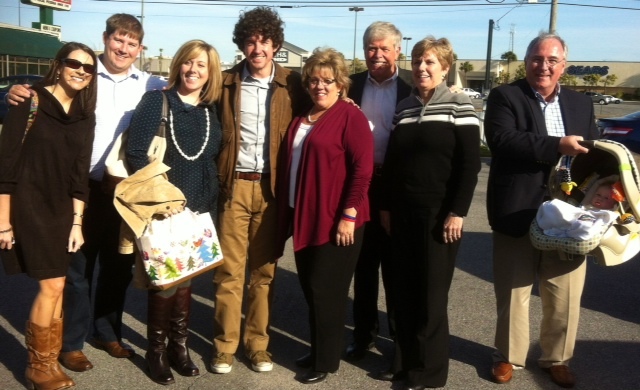 The family, in honor of Drew wanted to celebrate Drew and his character by doing Acts of Random Kindness. Well, his whole family (including Allison’s family) decided that one of their acts was to get me a new dulcimer. So Amy’s plan was coming together. Amy contacted a couple of makers, contacted my family, and even a dulcimer friend to make sure she made a good choice. Because as Amy put it, she didn’t want to just get me any dulcimer, but the dulcimer of my dreams! So, she contacted Russell Cook, one of the best dulcimer makers in the country, maybe even the world, and she explained everything. Also, my friend Josh Messick (professional dulcimer player) talked to Russell to make sure I got something that suited my playing and music. Russell was just in the middle of finishing a dulcimer that was a new style to his special “Russell Cook Edition” dulcimers. It had extra bass strings on one side. Russell thought this would be the one. So after some prayer and consideration, Amy felt peace about Russell’s dulcimer and everyone pitched in and bought it for me. However, I didn’t know that until Saturday, December 22nd. That day, Amy was going to be in town to visit her Mom and Dad, Scott and Marlene Holmes (Drew’s aunt and uncle). They lived just 20 minutes away from my family in Franklin, TN. She invited me casually through e-mail saying, “if you have the time, I would love to show you my dulcimer and you could meet the family.” Amy has always been so kind and inclusive in sharing with me her dulcimer excitement and such; so I didn’t think it was odd at all that she would invite me over. However, that same day I was asked to play at a worship service. My rehearsal was at 3 pm and she wanted me to come over at 2. So, I told her that I couldn’t do it unless we could meet at a different time. Well, my mom was in on the secret too. So, mom one day basically told me, “Hey, we are going over there to visit at 1 pm, come if you think you could make it.” So, my mom casually gave me the option to come or not. I didn’t think I would because I had to practice and get to rehearsal by 3. Let’s just say that I was SOOO glad I finally decided to go. So, we went at 1 in the afternoon. We walked into the Holmes house. I first noticed all the Ole Miss memorabilia. We felt right at home because my Dad is an Ole Miss alumnus. There was a scent of freshly baked pastry and other delectable food in the air. Apparently, they were planning us to have lunch there. We met Scott, Marlene, then Amy, her husband Jonathan, and their baby boy. During the whole time, I noticed a hammered dulcimer in the corner of my eye standing in the middle of the living room next to the Christmas tree. I try to control my impulse urges and excitement around musical instruments, so I was content just meeting everyone and chilling. I thought, “I’m sure Amy will show me her instrument at some time.” Well, that moment finally came. She said, “Come check out my new dulcimer.” On the inside, I was a giddy young boy jumping up and down, but on the outside I was a cool, reserved Nashville musician. With a look of calm and self-control, I said to her, “Hmm, sounds good,”as I tried to hide the giddy little boy. The first thing I noticed was its incredibly beautiful wood. It had maple, rosewood, mahongany, and an exotic wood called bocote. The bocote is a tropical hardwood (I like that!) from Mexico and Central America. It is warm-brownish, almost orange, but has dark, almost black, thin grain that runs around and makes amazing swirls and waves through the wood. She continued to tell me that it was all hand-crafted, and is a one of a kind dulcimer since it was a brand new style. Also, it was made by Russell Cook and is a special “Russell Cook Edition.” She shared that it had dampers, which are like the felt on a piano that rest on the strings to keep them from vibrating. I have always wanted dampers on a dulcimer because they add another element of control and tone. Surprised, I asked, “this is the one you got from craig’s list?” She said that it wasn’t but a new one. I thought to myself, “Man! I wish my first dulcimer was this amazing!” But, I kept that to myself. So, I broke my reserved, Nashville musicianship and said with big eyes, “Wow, this is the most beautiful dulcimer I have ever seen.” The giddy boy came out. Amy said, “Why don’t you try it?” She didn’t have to ask twice. I jumped right on it. I tried a few strikes of the strings to hear the tone. It was like taking the first bite of your favorite pie your momma cooks on thanksgiving, warm and fresh from the oven. Mmmm, sound never tasted so good. Seriously, the tone was incredible. It was a perfect balance of brightness and depth as the sound resonated the whole body of the instrument. Immediately, I knew this was built by a master luthier. Then, I moved on to trying the dampers. It was a little awkward at first, but I didn’t care. I was amazed at how the dampers caused just a drastic difference in tone. It almost sounded like a marimba. I barely noticed people were taking pictures but I didn’t think anything of it. I was having too much fun. Scott & Marlene Holmes, Amy & Jonathan McDowell, Scott, Marcia, Allison, Marc and Luci MacLean, Bill & Teresa Husfelt, Melissa & Dale Jones, and Sharon Comerford. 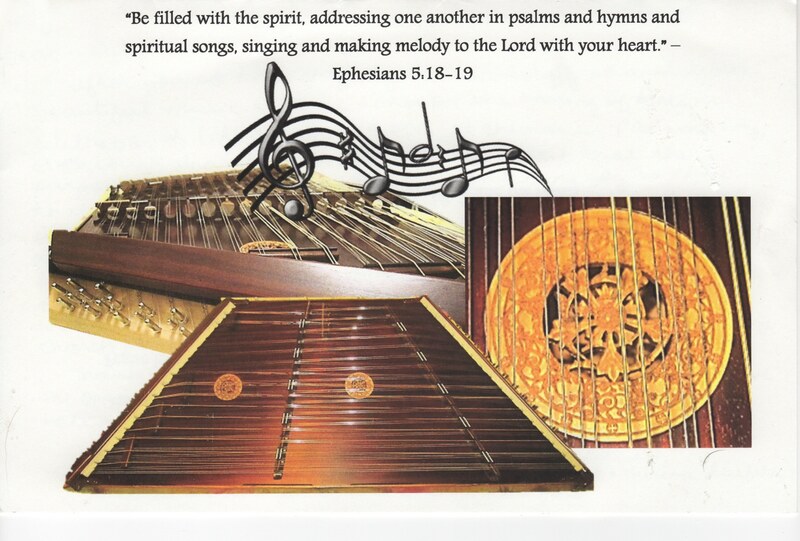 The front of the letter had beautiful pictures of the dulcimer from different angles and musical notes which they had edited and designed with this scripture on the front. She also gave me a personal letter from Russell Cook, the maker himself. This meant a lot to me. I was and still am blown away by it all. But, not because of solely the dulcimer (thought it is amazing) but more because of the story, which is why this is so significant. That’s why it makes the dulcimer, more than a dulcimer. That’s a greater gift. But I wonder to myself, how did this happen? Was it because we went back and grabbed an instrument 6 months ago on our way down to Florida? Was it because Mom had peaches and tomatoes to drop by Marcia MacLean’s house? Was it because Marcia invited us in? Of course these things were all done by God’s abundant grace, because without it, these events of mutual blessings could have easily NEVER happened. However, how did this all start? I am not content with just the words above. Because, there is one graceful factor that trumps them all, and that is, Drew MacLean. Yes, it is Drew that brought these relationships together and intersected paths with which may have never intersected other wise. It is Drew that is inspiring so much generosity; for my gift was simply one of many more acts of random kindness done for His birthday. Its his Life, not in the past but now and ongoing, that is in return spurring us to live for that Life with unending joys and surprises at every corner. For God loves us dearly and not one life of his beloveds goes on without producing much fruit. Like a seed is planted and dies, then grows into a tree maybe a thousand times bigger. In such a tree, tired birds may find rest and shade from their journeys. Those birds may even find friends while there. And, the tree produces fruit and seeds to start even a whole forest. Just like the seeds life goes on, so is this. Drew’s life is an ongoing Life. Drew is and not was. Not swallowed up by death, but “swallowed up by Life” itself (2 Corinthians 5:4). I personally must say a big THANK YOU to Drew and his family. Amidst the countless people who have been impacted by you’re life, I can attest for myself that y’all have blessed me beyond just a mere dulcimer, but by this amazing story that I get to tell every person that sees and hears me play. It’s something I get to pass on to my family now and into the future. It is riches of love that I get to overflow into others’ lives. I’m so glad I didn’t make the top three of the national competition, for this is an award and trophy far better that won’t fade. I hope I make your investment return 100 fold! Drew has blessed me and my family over the past months. Yep, Drew is alive. I think it’s safe to say that he is in the ministry. And, this is probably just the first chapter of my Drew Story. P.S. Drew’s living legacy is in the far right picture in the baby carrier, Ruby Lynn MacLean! God bless you and Allison.